The Groundhog prefers open country and the edges of woodland, and it is rarely far from a burrow entrance. Since the clearing of forests provided it with much more suitable habitat, the Groundhog population is probably higher now than it was before the arrival of European settlers in North America. Groundhogs subsist primarily on wild grasses and other vegetation, supplementing their diet with berries and agricultural crops when available. Though not as omnivorous as many other sciurid’s, Groundhogs will also eat grubs, grasshoppers, insects, snails and other small animals. What if they live near your home? Groundhogs prefer to retreat to their burrows when threatened; if the burrow is invaded, the Groundhog will tenaciously defend itself with its two large incisors and front claws. Additionally, Groundhogs are generally agnostic and territorial among their own species, and may skirmish to establish dominance. With that said, if you try to attempt a capture and fail you may cause the Groundhog to retreat to its burrow and defend itself. 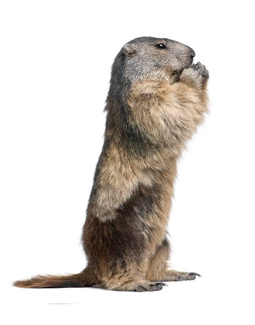 Call Shumaker’s Animal Control at 443-854-8072 and we will remove the Groundhog. Groundhogs are excellent burrowers, using burrows for sleeping, rearing young, and hibernating. Groundhog burrows generally have between two and five entrances, providing Groundhogs their primary means of escape from predators. Burrows are particularly large, with up to 45 feet of tunnels buried up to 5 feet underground, and can pose a serious threat to agricultural and residential development by damaging farm machinery and even undermining building foundations.